SEO vs. PPC…and Google Checkout? With reports that Paid Search Advertising spend decreased in Q4, it begs the question, is a marketer more willing to pay for a visitor or drive that visitor naturally? E-marketers who are using ROI as a measurement of success don’t want to pay for visitors, they only want to pay for customers. This is online marketing 101. Recently we have had some clients see their overall search revenue and transactions number increase, while those same numbers for natural search actually go down (as well as maintaining the same positioning month over month). Hmm…does that mean anything? If so, was one of our clients involved named the Dharma Initiative? OK, maybe not, but let’s take a deeper look at what may be happening. ClickZ recently had an article on how to run paid ads without users overlooking your natural listings. While the cannibalization (Liver with some fava beans and a nice chianti, anyone?) part makes valid points, it would behoove your online presence and bottom dollar to approach this from a holistic approach. Meaning, you should also take a look at your back-end analytics as well while considering this aspect (Hey, you leave my back-end outta this!). With Google’s OneBox results, even if your listing is the top one naturally, it may be pushed from above the fold in the SERP (paid listings, videos, shopping feed results, etc.). Point being, your natural listing may not jump off the page to entice that all important free click. 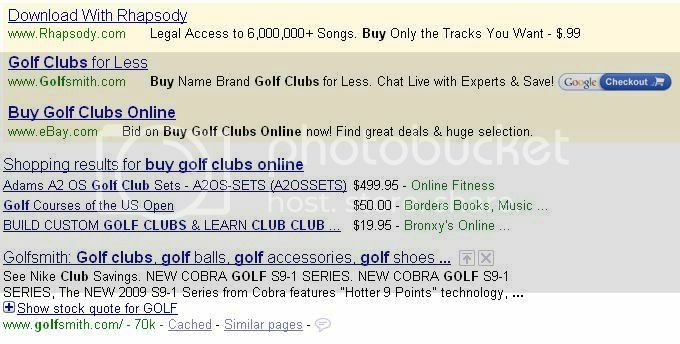 For example, when searching on ‘buy golf clubs online’, what listing would you click on in the below SERP? This is a snippet of an otherwise busy SERP with additional paid listings on the side and the other natural results below. 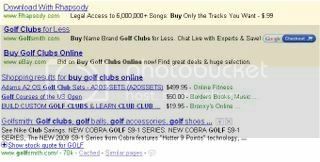 This may be a case where Golfsmith’s paid listing is driving more traffic with less conversions than the natural listing. Golfsmith is not a client of ours, but they would need to look at their analytics data and make a decision based on the data. If that’s the case, they would need to analyze the CTR as well as the ROI of both listings. Does anything else stand out in this SERP? The paid listing includes the Google Checkout icon which Google claims make the ad more clickable. If this is the case, does this improve their CTR AND their conversion rate? If so, it may be worth it to test a lower position along the side of the page and see if the natural listing could drive more (free) traffic and increase sales to make up for the lower paid positioning. Also, marketers are usually reluctant to share conversion and back-end data with Google, but it would be interesting to see if Google has any studies that show ads with the Checkout logo increases both CTR and conversion rate. With a fledgling economy and clients tightening their budgets, it may be time to stop operating your paid campaigns in a bubble. So the bottom line is that if your paid ad is more clickable, try to ensure that it’s not taking away clicks you don’t have to pay for. It may take a little extra effort, but isn’t that what makes this industry so fun? Ok, maybe that’s just me.